Below is a letter Sylvie, our editing volunteer, sent to the President Moon Jae-In. Thank you, Sylvie for all your help with editing and for being the voice for the animals in the Korean dog and cat meat trade. Everyone should send your letter today. You can use our sample letter or write your own letter from your heart like Sylvie did. First of all, I want to congratulate you for your victory! I am very pleased that finally, a person of integrity and morality had been chosen by the people to lead their country. The world now, is in economic, social, and environmental collapse. This degradation is reflected in the treatment of animals – wild and domestic. I am an American, living in Bali Indonesia, where animals are treated as vermin, as commodities, without sentience or soul. For several years, the Bali government has been culling all free-roaming dogs, many of whom are beloved pets, or homeless animals already being fed, medicated, and loved by the many kind people who cannot give them a home, but offer them sustenance and love. Despite the National Animal Welfare Law 302 of 2009 which strictly forbids cruelty, caging, abuse, culling by poison, etc., the cruelty and abuse continues because the law is not enforced. In 2016, the dog meat restaurants numbered 50 throughout Bali. Since then, the number of dog meat establishments have risen by 100%. Dog meat is not listed as “livestock” and legally cannot be used as food for human consumption, though this point is ignored by both the government and law enforcement. In So. 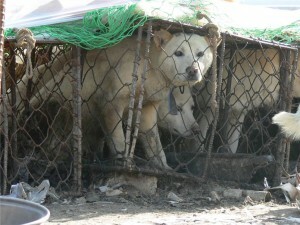 Korea, dogs are on the “livestock list”. Why is that? Dogs are companions and warriors during war, they can detect cancers, they serve as service dogs for the physically disabled, for trauma patients, for autistic children, for the blind. They are also used for search and rescue, for illegal drug detection, as companions to law enforcement to apprehend criminals, and companions and loyal friends to humans. Please appoint Dr. Woo Hee-Jong as the Minister of Agriculture and Food and Rural Affairs, and recommend to him to remove dogs and cats from the “livestock list”. And, please put a permanent end to the dog and cat meat consumption in South Korea. There are only a minority of So. Koreans who have a “taste” for dog and cat meat. I’m sure the majority of your citizens will hail you as a champion for animals and certainly, you will be the first leader in Asia who had the integrity, morality and courage to use your power to demonstrate compassion for the helpless. You can set an example for all of Asia and the rest of the world.